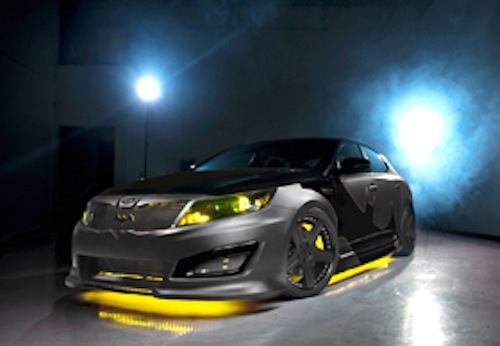 Kia, DC Entertainment and Rides magazine have teamed up to produce a Batman-themed Kia Optima to raise awareness for the We Can Be Heroes campaign helping starving children in the Horn of Africa. Kia’s flagship sedan, the Optima, is getting the royal Batman treatment and this one-off Dark Knight car is being unveiled at the Time Warner Center in New York this week. The one-of-a-kind Optima was built to raise awareness for the We Can Be Heroes giving campaign. The campaign is helping people in the Horn of Africa who are experiencing a severe hunger crisis. Three countries in this area of the world, Ethiopia, Somalia and Kenya are experiencing the worst drought in 60 years. According to the We Can Be Heroes website, this is a major crisis and has displaced people in that region of the world and they are facing starvation and death at alarming rates. More than 8 million people are needing assistance and thousands have fled seeking help in nearby refugee camps. We Can Be Heroes says, the situation is so critical, that the UN officially declared the region is in a severe famine last July. The famine was lifted in February when humanitarian organizations flooded the region with aid. But the displaced families still need more help. That’s where the Justice League and DC Entertainment is trying to raisie awareness and funds for three nonprofit partners, Save the Children, International Rescue Committee and Mercy Corps. The three organizations are providing the much need aid to the Horn of Africa where it is needed most. They are providing access to food, clean water and healthcare. They also are helping communities to build long-term solutions to the regions drought and hunger issues. The Batman-inspired Kia Optima goes on display this week at the Time Warner Center and according to the Kia press release, “signals the beginning of a 10-month partnership” based on the iconic characters that make up the Justice League. Those characters include the world’s greatest super heroes: Batman, Aquaman, Green Lantern, Wonder Woman, Superman, The Flash and Cyborg. Michael Sprague, executive vice president, marketing and communications for Kia Motors America said, The top of the line Kia Optima SX Limited is the perfect platform to introduce our partnership with DC Entertainment and the Justice League to benefit the 'We Can Be Heroes' campaign." Kia, DC Entertainment and RIDES magazine all worked together to built the Batman-themed Optima. The one-off black Optima gets a matte- and piano-black paint scheme, a dramatically lowered coilover suspension and muscular ground effects kit. It also comes with K sport performance brakes, 20-inch black wheels and a performance exhaust system. Other exterior modifications include a custom front grille shaped like a batwing that Kia says took over 40 hours to create, yellow LED lighting accents throughout the vehicle and the iconic bat signal etched into the HID headlights. For those interested in helping the people in the Horn of Africa, DC Entertainment, the largest English-language publisher of comics in the world, will match donations 100%, and up to 75% of the purchase price from We Can Be Heroes products will go to saving lives. “One small act can make you a super hero.” You can give now by going to the We Can Be Heroes website. Watch the DC Entertainment's We Can Be Heroes video.